Remember this poll on the Star Advertiser a few weeks ago? Note that these polls aren’t too reliable for multiple reasons, but the fact that homelessness is a top priority on the minds of the voters is telling. No one can ignore the fact that there are homeless everywhere throughout our entire state and it’s an eye sore as well as saddening. In the practice of occupational therapy, we know that by engaging in meaningful activity, we can restore well being physically and mentally. As I watch many of these folks, they appear to be functionally doing pretty well. I see them lowering themselves down to the sidewalk, laying down on it and getting up with ease much of the time. Some of them can pace back and forth on highway medians begging for money for hours. Others are able to squat down for hours outside of public places looking for handouts. There is a lot of meaningless human energy here being wasted that could really be converted into meaningful work like being on a farm and growing food. Voila! Why not create a community based program that combines these two issues: growing food and homelessness. For one, you’d get people off of the street and into some form of meaningful activity and work. They could work on a farm growing food as well as have a roof over their heads. These people will be able to receive treatment for their conditions as well as not be an eyesore in public places. They would also be doing something good for others and themselves by growing food. That’s beautiful to me and I know it works based from my own experiences. As a Star Advertiser Off the News post today said, we should end the food fight, and they are right. Rep. Jessica Wooley wants more people to grow food and to keep agricultural lands in farming, while others want to take care of the homelessness problem here. Let’s give Rep. Wooley her farms and walk the talk by doing what she proposes to do with it. Then other’s like Rep. Tom Brower don’t have to get frustrated with the carts and homeless people all over his district. From an email sent out by Jessica Wooley’s camp showing how she thinks biotech is only about the agribusiness companies. Note that HB147 is about firearms and not about GMOs. We all know that Rep. Wooley isn’t a local person when she only stands for the activists and their demand to only go organic. Local style is to take all sides and work together and come to an understanding and a plan. As she states in her letter, she doesn’t like the “status quo.” You might not like how we do things here, but you can’t just come in and tear our livelihoods apart the way your activists demand. It’s also too bad that other locals like Rep. Kaniela Ing have jumped on this fighting attitude. That’s not the way we do things local style. This is our Hawaii as much it is yours, but to point a finger at us law abiding family farms is basically standing on our yards telling us how to farm. I don’t like this and many others too. Your letter refers to fighting, and we don’t like to fight but are forced to. Let the farmers farm, and go start up your small sustainable farms in the country. Do your job for agriculture and work collaboratively for the sake of everyone involved. Be creative in your plan, not just worried about your way or the highway attitude. Take care of people too, including the homelessness by coordinating with other committees and do it. The farmers have had enough of your activists attacks and here’s a way to give them what they want. The attitude needs to change from “only organic” to “how can we solve this problem together.” I ask that we end the fight now and actually do something purposeful with your talks about growing food and be that leader to stop the attacks against the biotech farmers big and small. The bottom line is that we need all forms of agriculture. Live, eat, and drink farming rather than continuing to legislate what you don’t know on, and see a whole different side of the picture. Take the path that will lead to helping people based upon evidence for it is better than leading us into a war. That’s what a true leader would do. Can you be that true leader and work with everyone? Just this past Sunday, Amy Harmon, a Pulitzer prize winning NYT writer, did a great story about a Hawaii County Councilman’s journey through what I call the fear mongering jungle here in our state. It is something that many of our politicians should read about to get through the fact vs. the fiction around the issue. It is a long read but covers through many of the statements that one has heard in testimonies from the anti-GMO activists. It also points out to the resources that debunk many of those same claims. It is of no surprise that the anti-GMO activists have jumped on this story. Their retorts on this is far from facts but once again at personal attacks. Just take a look at what Food Democracy Now posted about it on their Facebook page. This kind of tactic only proves more and more that there is no facts or evidence in the so called GMO debates. It’s based on conspiracy theories, propaganda, and fear mongering when they have to come down to this level. 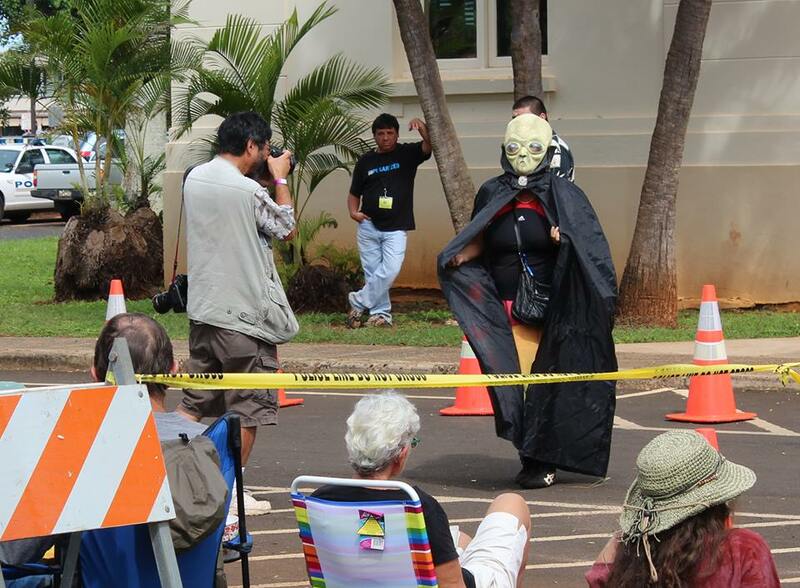 Characters of the anti-GMO club of Kauai. As I have followed so many commenters from the anti-GMO club there is definitely a pattern. One one end you have the very vile, nasty, ones that have been fear mongered beyond recognition of a rational being. On the other end you have those that believe that consuming organic food is much more holier than thou art and wanting a label. Somewhere in between you have those that are anti-corporation, conspiracy theorists, and just plain old science deniers and earth saver greenie folks. Also in the mix you’ll find the ban it all group, who really have no clue the extent of this technology. It’s no wonder there are social workers, bus drivers, grandmas, pseudoscientists, criminals, entertainers, models, nurses, chemical sprayed doctors, religious preachers, radio hosts, MMA fighters, and surfers all in this mix. Approximately 4000 of these folks supposedly marched on Kauai a few months ago to speak for the people. You know, if 4000 really were a true number of people joining in, can you imagine the manpower you have there in one area? They all marched along Rice Street for some distance that means the majority are all able bodied and has the potential to do something good with their energy. That energy and planning should be put to good use to put their money where their mouth is. I have a few suggestions for these marchers as far as how they could really strengthen their cause. We all know that they want less pesticide use by the seed corn farms that use 13% of the county’s total. Who is using the most pesticides then? It’s the county themselves! Maybe on the next march, they can coordinate with the Kauai County to do a highway weed pulling patrol. Spread out 4000 people along the highway to pull at least 50 to 100 yards of weed each and wow, imagine how much less spraying will be done and less contamination too? You could do this every month and cut back or completely be pesticide free! Another way that these marchers could help reduce pesticide use is to take advantage of the natural instincts of our little chihuahua terrier mixes that are so popular now. If may be 20 marchers brought out their little dogs to the power plants or kept them tied to the power poles a few days a week, we could cut down the need for using rat poison since these little dogs are bred to kill rats. Chemical free, all natural pest control at best which is what the anti-GMO club is demanding. It is pretty well known that Bette Midler is an anti-GMO activist also and she has lots of land on Kauai. She has 1400 acres of it too! We’d better alert Jessica Wooley because she doesn’t want to farm it for food but possibly grow hardwood trees on it. Wouldn’t it be great if she donated a nice piece of her land to start up a Save True Kauai Farm there? Or maybe a GMO/Pesticide Free farm there? You could get that guy who couldn’t lease land from the seed companies and maybe 100 of the marchers to even work on that farm. They appear to have lots of time since they were able to camp out at many of the hearings and stay really late there too. The anti-GMO club can have their dream turned in to reality where they can feed the people their way. Many people there also hate the dust from tractors plowing the lands. If you take about 50 to 100 marchers and handed them a shovel and pick axe, you could plow a one acre field in no time with little to no dust cloud either. Then instead of using heavy equipment to plant the seeds, each of these folks can hand plant it all. Every few weeks they could come in again and do weed patrol too so that they don’t have to spray the dreaded weedkillers. You can also bring in more marchers to do bug patrol too and pick off bugs from the plants to keep less pesticides off of it. 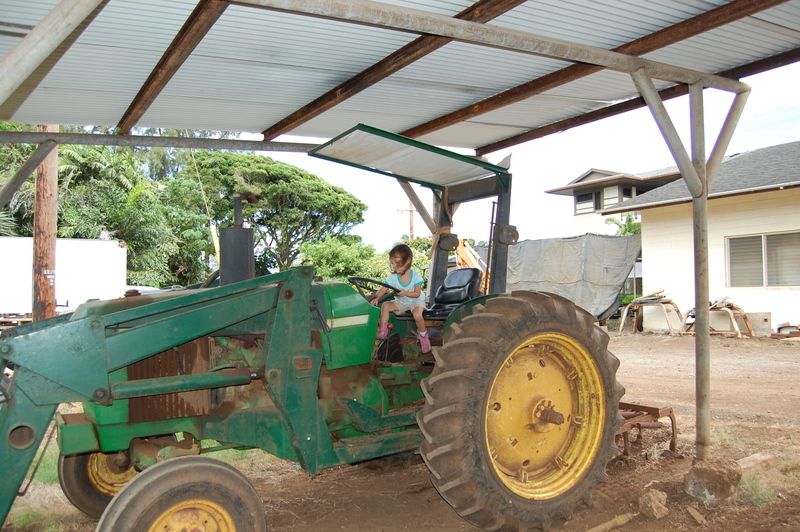 What a great way to teach the keiki to how to grow your own food and keep the dust and pesticides away! 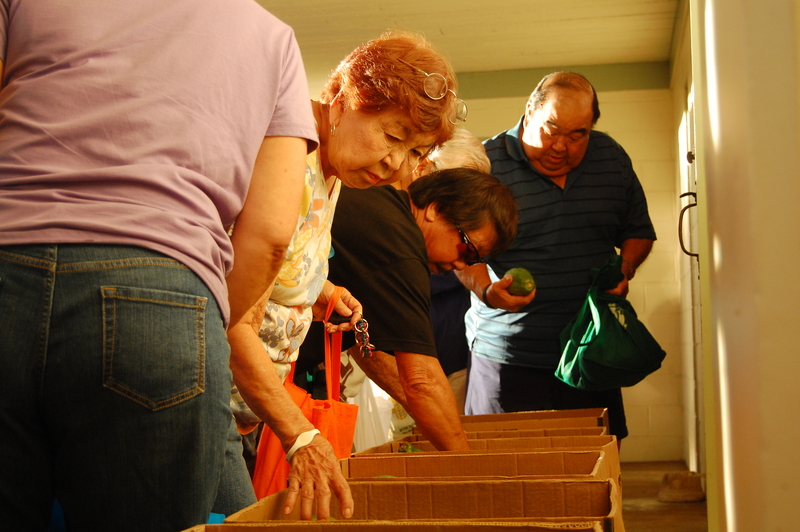 There are a lot of needy people across our islands and Kauai has its share. The anti-GMO club staunchly believe that the seed companies are not feeding the world in any way or form. With several thousands to volunteer and donate time, money, and energy, they could start showing the world their plan to feed the hungry because it is obviously more superior than what the other companies are doing. This would truly be a great and innovating cause to show how much they malama the people and the land. The potential conversion of marchers and people rising up to support this way of agriculture is truly amazing because it can be put to good use. No one would have time to be sending death threats to the mayor, writing comments all over the social media, be exposed to less scary images on their Facebook feeds, accusing seed farm workers of killing babies and committing crimes against humanity, and will be able to live the natural healthy life that they all preach about. Human energy can be converted to good when you put your money where your mouth is. Volunteers anyone? Let’s do some math here… 4000 x $1.50 is $6000. If all the marchers paid a mere $1.50, their bill would be covered. Enough to pay the county back for their march and restore the county’s funds. If some of the attendees could afford plane tickets, I’m pretty sure they could afford that pocket change to participate. So has the Kauai County received some money to cover it yet??? I realized last year, with the brouhaha of the failed labeling law, that we do not have enough local voices in politics. I decided to start participating in the neighborhood board meetings. I have been attending these meetings monthly since June this year. At this last meeting something very peculiar happened. Jill Tokuda and Ikaika Anderson’s representative attended as usual and are very regular in their participation to notify the community of what’s going on and what they are working on. The others like Clayton Hee, Cynthia Thielen, and Ken Ito, are non-existent. Jessica Wooley will send a representative twice but never attended it herself since June. At this past month’s meeting, no one on the board recognized her, and as a result, and mistook her for another presenter. As I listened to her answers and statements, I started to think more about what she was saying. Okay so you feel that there is no regulation, which is completely false, and that a label is going to suddenly create this sense if transparency that her “constituents” want. Something doesn’t make any sense here. Why is a label suddenly going to solve the transparency and so called “right to know issue” after you just stated that there is no regulation? If you are so concerned about no regulation, then why don’t you work at the federal level to start these regulations that you claim there is none? Doesn’t that make more sense? If you were to travel to somewhere else, as a consumer, you won’t be able to get your right to know since there is nothing across the board by state. A consumer could unwittingly eat GMOs at a restaurant and that would be such a travesty too because that is not labeled! Even the locally produced foods like papaya seed salad dressings to some locally made taro chips would all need a label too so that these folks’ right to know are fulfilled and that they are suddenly enlightened by this label! Poor Hawaii constituents would not have their rights respected Ms. Wooley if they were to go to a Las Vegas Trader Joes! You’re not protecting peoples’ rights! What a non-tragedy! Of course Ms. Wooley doesn’t show her transparency when it comes down to who’s feeding her this information. 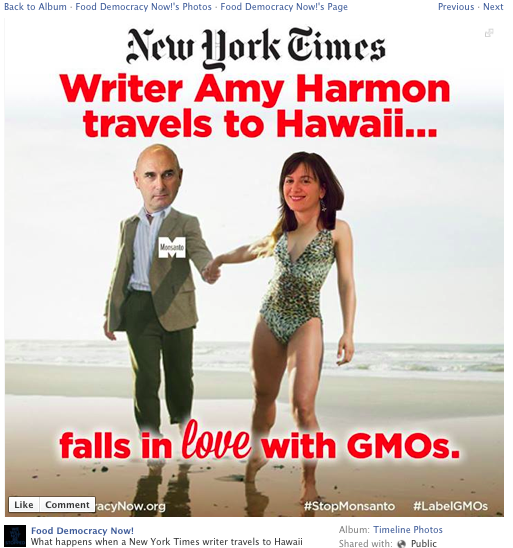 She is well connected to anti-GMO groups like Center for Food Safety attorney, Andrew Kimbrell, and is married to David Henken of Earthjustice. 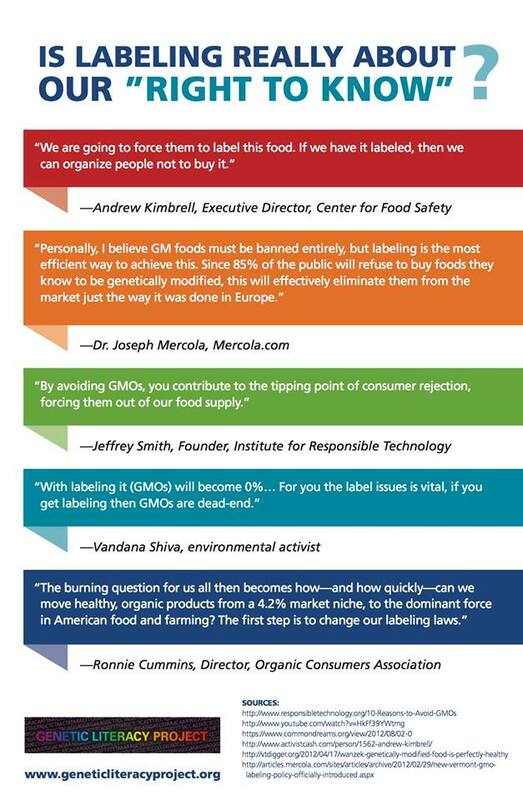 Take a look at what these people say about why they want this label from the Genetic Literacy Project. Knowing all of this, I asked her if she was aware of what is happening to many small farmers in the community. I shared with her, as well as all the board members present, about how some farmers reported being asked if their bananas and produce were organic. When it was told to the person that it wasn’t, the questioner tossed it aside very rudely and marched away in disgust. Jessica raised her eyebrows stating that she was not aware of this and it should have turned into a police report of some kind. I told her that these farmers are afraid to speak up against this and become targets. Local people don’t speak up against these activists for that very reason. I’m not sure which planet she lives on but these anti-GMO activists have been doing this for some time already and there was a public incident with this already that made the news. We all know that there is a lot of hope in the anti-GMO movement that somehow this is going to make people eat healthier. Do you actually think that a little sticker on a package is going to help that? When those fat free labels appeared on food stuff did it make people eat better? Uh, no. Shame on her for thinking that this really is going to make a difference all to earn more money from consumers marketed with fear. That’s where shortsighted thinking in politicians get us no where. A label isn’t going to change people’s weights! Education about healthy eating is! If Jessica Wooley is really wanting the focus of agriculture to be on food and growing it, I suggest she rethink her strategy. Making more laws against farmers isn’t going to make more people want to get into farming. It already is a difficult business to stay afloat given the high costs of land, labor, and supplies. It doesn’t help that weather, disease, and other uncontrollable variables can devastate your whole year’s worth of work either. If you make laws to limit the tools and research in agriculture, that itself will make it even less viable as a profession. Does that mean your out to kill farming that isn’t organic because it sure appears that way? I was sent some commentary about the petition that was posted to help open up a forum for others to speak up for our farmers. This has created a small storm of controversy in the GMO Free Groups of course and someone sent this comment to me. I find it amazing that her GMO Free followers actually get it but they just don’t connect the dots about what they say. Yes, farmers are poor and why are you making it harder for them to do their job Ms. Wooley and GMO Free groups? Wouldn’t it be better to ask them, “How can we make your job easier so you can do what you need?” That would be a much better option then outright stating that you need to label your produce because your right to fair treatment is outweighed by the needs of activists. That’s a pure kick in the face to our farmers. 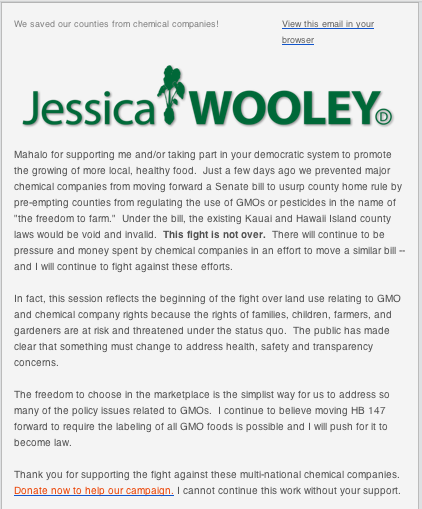 If Wooley is about fulfilling her role as someone who wants to make Hawaii better as a transplanted local, she needs to take off the anti-GMO hood and stop wasting our taxpayer dollars on that little label of hers. If she really wants to help people live better, have more farmers, and grow more food, she needs to get off her “right to know” “label it” podium and reinvest those monies and resources back to the farmers and towards educating the public about healthy eating if her motives were right. But we all know the truth about her agenda here which is plain to see where she wants to take small papaya farmers… Into extinction. 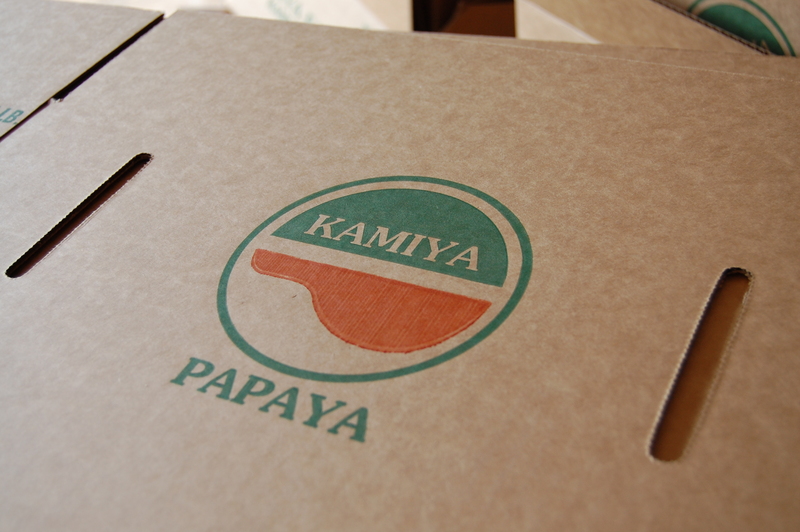 My mom reminded me that at 3 years old, my youngest sister was already stickering the papayas. As an 8 year old, I was one of the washers who cleaned the fruit before packing. From there I moved on to grading the fruit to some packing. It was hard work! I want my kids to experience that too so we headed down to the farm today. I already warned them that we were going down there to work and not just play. My older daughter agreed to it since she found out that she could collect recyclables and make some money afterwards. Today started out with my younger one, KK in awe of all the tractors everywhere on the farm. She saw some at the sales lot a few days ago and kept telling my dad that she wants to ride one. Just look at her face and see the thrill of just sitting on one. KK getting to hang out on one of papa’s tractors. She’s my dirty little farm girl kid. While the fruit was being picked in the fields by my dad’s hard working staff, we were preparing for the packing and processing. Harvesting is done by a forklift as the trees do get pretty tall and this is a much more efficient way to get the work done. Processing the fruit takes a lot of prep work. That included taping up boxes to pack in, setting up the bins and wash tub to clean the fruit in and setting up the sorting area as well as the final storage area after it was packed up. 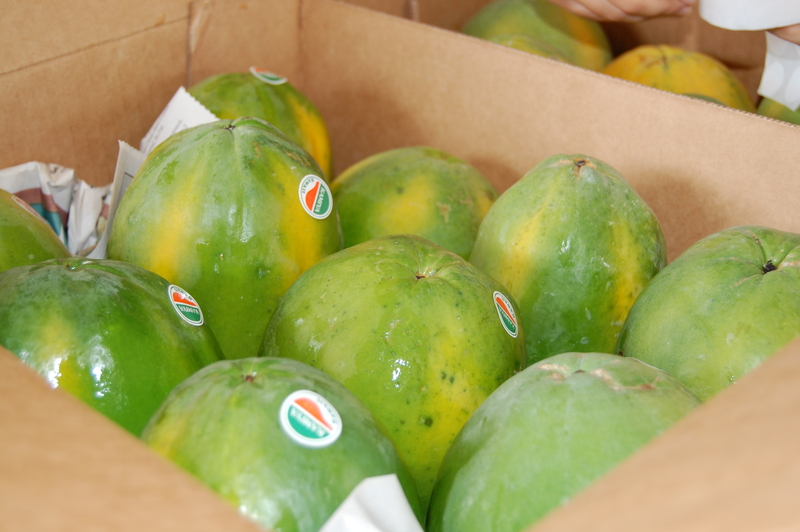 Our farm complies with all of the food safety certifications and follows the rules very closely with washing the fruit properly as well as handling it as approved. We are food safety certified with a perfect passing score according to my brother, Mike. 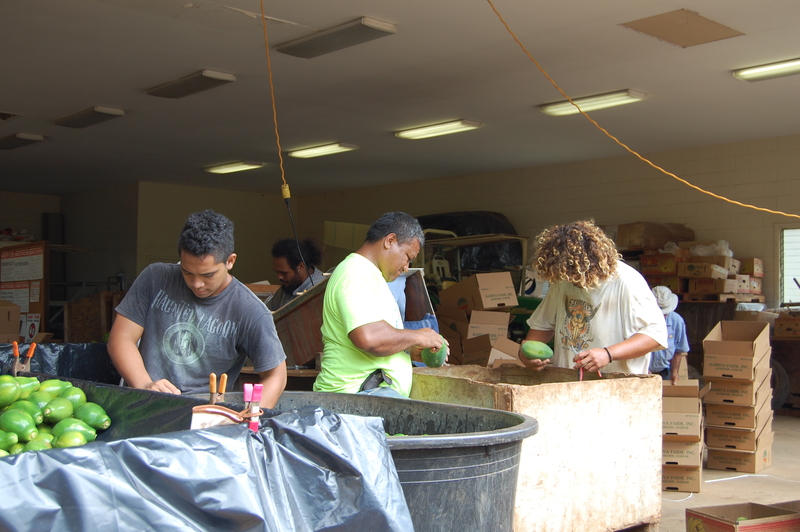 The hard working staff processing the fruit by grading it, washing it, and sorting it. After it is prepared, the fruit is then packed up according to size which takes some skill as to packing them properly. Finally after being packed, these fruits are stickered and palleted. 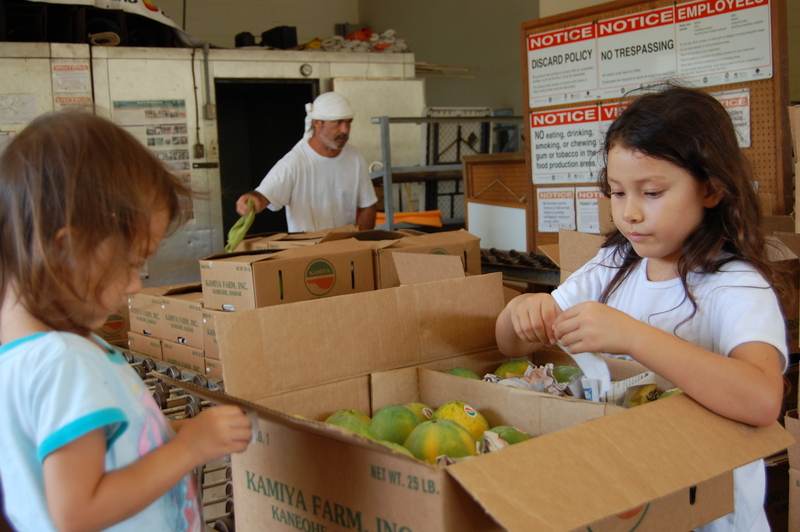 KK and Ky hard at work putting those exclusive Kamiya Papaya stickers on the fruits. Tomorrow it will be ready to go out to the stores, restaurants, small markets, and hotels to be sold or served up to their customers. Many of whom come clamoring for it every week for years!